World wonders like the Pompeii in Italy and the Parthenon in Greece make many people's bucket lists of what to explore before they die. But are the original sites always the best or only way to experience the wonders? 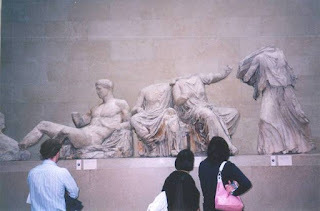 I thought about this question recently when I read about how the British Museum in London replicated one of the 15 Metopes which Lord Elgin had taken from the Parthenon on the Acropolis in Athens. Originally there had been 92 of these marble 5-feet-by-5-feet marble high relief figures in various battles circling the upper outside wall of the Parthenon. Depicted are the battle with the giants, battle with the Amazons, the Sack of Troy and the Battle of the Centaurs. 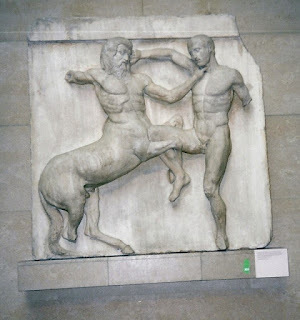 The front wall was of centaurs, half-horse-half man, battling Greeks after the centaurs tried to abduct Greek women. This means to see the Parthenon you would really need to go to two places, Athens and London. I visited Athens in 1972 with my wife and our two oldest teenage daughters. We admired the remnants of the building as the epitome of Greek culture, but in another way we found it a sad sight with rubble lying on all sides and most of the statuary destroyed, damaged or taken somewhere else. Before 1687 the Parthenon had been in excellent condition because of its original masterful construction in 456B.C. In 1687 during a war between Greeks and the Turks, a gunpowder explosion did significant damage to the interior. Even the sculptures transferred to the British Museum by Lord Elgin had missing pieces such as heads, arms, legs. 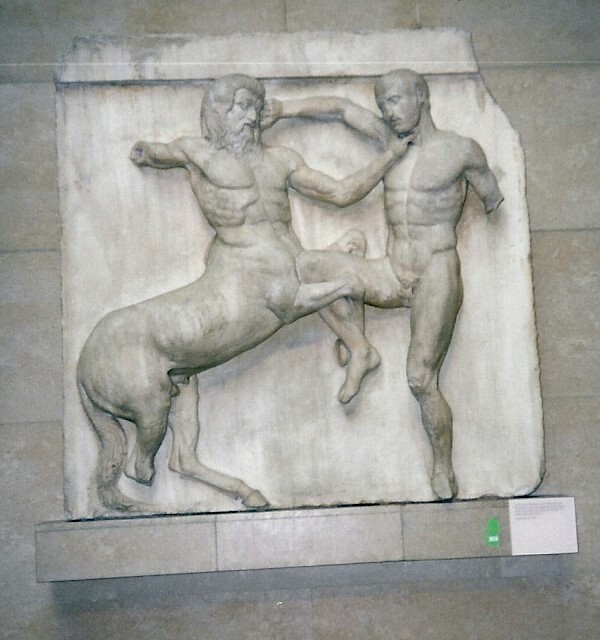 The British Museum picked one Metope to replicate, a centaur attacking a Greek who was on his back. Both heads were missing, the centaur was missing parts of four legs and both arms, and the Greek was missing a leg and an arm. A drawing from 1674 showed the Metope with both warriors in full body with heads. The heads had been taken by a Danish naval officer and are now in the Danish National Museum, Copenhagen. With this material available the British Museum was able to make a 3D picture of what the Metopes had looked like with all its parts, and by using a 3D printer had been able to make an exact copy of the physical object. The copy allowed them to add other details, such as the Greek's sword, his head piece and cloak. The Greeks painted their sculptures and this added drama and emotion to the completed Metope. When we visited Athens, the Greeks’ point of view was that Elgin had stolen their property and that the only honorable thing would be to return them. With this breakthrough in recreating exact replicas that give a truer pictures of what the originals were like will make it possible for Greece to partially recondition the Parthenon and restore it to some of its original glory. In the meantime if you don't want to wait, an excellent full-size reproduction is in Nashville, Tenn. Nashville built a temporary replica of the Parthenon in 1897 for the Tennessee Centennial and International Exposition. The builders got permission to make plaster replicas of the Elgin Marbles, which were displayed along the sides of the interior. The building was so popular, it was left standing. When it began to show its age, the city rebuilt a complete permanent replica that was opened in 1931. As marble is extremely expensive, it was built principally of reinforced concrete. Later renovations included unveiling a nearly 43-foot statue in 1990 of Athena, a replica of the original statue inside the Parthenon. Actually this copy gives you a fuller picture of the what original was like than the original in Athens does. In Athens you are standing on the ground that the Greeks stood on, and you are in presence of real history. In Nashville you are in the visual presence of what the Parthenon really looked like. Take your choice if you can't make all three spots--Athens, London, or Nashville. Nice post. Thanking you for this post shared with us. It is a type of review and I hope it will be more helpful to the readers. Today most of the students have the trouble with their academic tasks. Therefore they want valuable help from genuine sources. And expect a better answer for their questions like custom essay writing service. Today most of them are experienced with best services.